Commemorates the apparition of the Blessed Virgin Mary to three children in Fatima, Portugal on the 13th of each month from May to October in 1917. 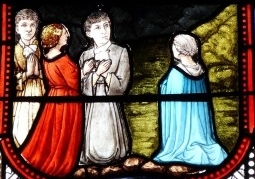 Our Lady appeared to Lucia, age 9, Blessed Francisco Marto, age 8, and Blessed Jacinta Marto, age 6, while they were tending sheep; they described her as "a woman all in white, more brilliant than the sun", and her message was to do reparation for sins that offend God, and to pray constantly for the conversion of sinners. She asked for devotion to the Holy Trinity, and for praying the Rosary daily for world peace. Word spread, and by the final apparition on 13 October, 70,000 people showed up to witness the Lady and the sign that she had promised; they witnessed the sun make three circles and zigzag around in the sky. Devotion to the Blessed Virgin Mary under this title began in Palermo, Sicily in the 14th century, and has since spread throughout the Augustinians. 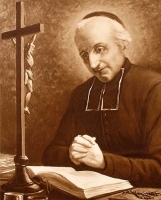 It began when Father Nicola Bruno, who suffered from severe and long-term pains in his side, prayed to Our Lady for healing while meditating on a painting of Mary in which she used a stick or club to chase away the dragon and protect the infant Jesus; the artist was making refence to passages in Genesis and Revelations that referred to the eternal enmity between The Woman and the serpent. That night, Father Nicola received a vision of Mary and was healed. The painting received the title "Our Lady of Help", and the devotion began. Since 1804 the celebration has had its own liturgy. Now the snake was the most cunning of all the wild animals that the LORD God had made. He asked the woman, "Did God really say, ‘You shall not eat from any of the trees in the garden'?" The woman answered the snake: "We may eat of the fruit of the trees in the garden; it is only about the fruit of the tree in the middle of the garden that God said, ‘You shall not eat it or even touch it, or else you will die.'" But the snake said to the woman: "You certainly will not die! God knows well that when you eat of it your eyes will be opened and you will be like gods, who know good and evil." The LORD God then asked the woman: What is this you have done? The woman answered, "The snake tricked me, so I ate it." Then the LORD God said to the snake: Because you have done this, cursed are you among all the animals, tame or wild; On your belly you shall crawl, and dust you shall eat all the days of your life. I will put enmity between you and the woman, and between your offspring and hers; They will strike at your head, while you strike at their heel. She gave birth to a son, a male child, destined to rule all the nations with an iron rod. Her child was caught up to God and his throne. The woman herself fled into the desert where she had a place prepared by God, that there she might be taken care of for twelve hundred and sixty days. Then I heard a loud voice in heaven say: "Now have salvation and power come, and the kingdom of our God and the authority of his Anointed. For the accuser* of our brothers is cast out, who accuses them before our God day and night. They conquered him by the blood of the Lamb and by the word of their testimony; love for life did not deter them from death. Therefore, rejoice, you heavens, and you who dwell in them. But woe to you, earth and sea, for the Devil has come down to you in great fury, for he knows he has but a short time." When the dragon saw that it had been thrown down to the earth, it pursued the woman who had given birth to the male child. But the woman was given the two wings of the great eagle, so that she could fly to her place in the desert, where, far from the serpent, she was taken care of for a year, two years, and a half-year. The serpent, however, spewed a torrent of water out of his mouth after the woman to sweep her away with the current. But the earth helped the woman and opened its mouth and swallowed the flood that the dragon spewed out of its mouth. Then the dragon became angry with the woman and went off to wage war against the rest of her offspring, those who keep God's commandments and bear witness to Jesus. Born to a poor but pious farm family, they all moved into the village of Goriano Sicoli, diocese of Sulmona, Italy to try to improve their finances. Gemma was orphaned while still a young girl when both parents died in an epidemic; she lived with relatives and worked as a shepherdess, using her time in the fields to pray. 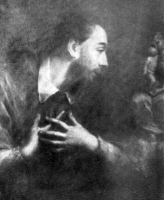 She was such a beautiful young woman that Count Ruggero of Celano courted her, but Gemma was drawn to religious life and turned him down. He was so impressed with her dedication to her vocation that he built her a cell next to the church of San Giovanni in Goriano Sicoli positioned so that she could see the altar during Mass, and could give spiritual guidance to any who asked. She lived as an anchoress for her remaining 42 years. Bishop of Tongres (in the modern Belgium) for 37 years. Welcomed Saint Athanasius of Alexandria during his exile by the Arians. Worked to remove heretical bishop of Cologne, Germany in 346. Active at the Council of Rimini in 359. Prophesied the mid-5th century invasion of Gaul by the Huns. Andrew had a strong religious upbringing, nagged by his mother to become a priest. Andrew resisted, and tried to study at Poitiers, but began leading a wild life. Out of school, his mother convinced him to stay with his uncle, a priest. The uncle's good example so moved Andrew that he turned his life around, returned to his studies, and felt the call to a vocation. Parish priest, assigned to Maille, France. During the French Revolution, Andrew refused to take an oath that renounced the Church. He fled to Spain 1792 for five years, then returned to his parish, and was protected by his flock, celebrating the sacraments in secret. Andrew and Saint Jeanne Elizabeth Bichier des Ages, a local holy woman, founded the Daughters of the Cross of Saint Andrew. Almost nothing is known of her early life; we don't even know if she was from Norwich or chose to move there. Recluse under the direction of Benedictines in Norwich, England. Mystic, visionary, and writer. Her book, Revelations of Divine Love, which contains sixteen revelations she received while in an ecstatic trance, is still in print. She meditated on, spoke on, and wrote on the power of love of evil, Christ's Passion, and the nature of the Trinity. In her early 60s she shut herself in complete seclusion at Conisford, Norwich, and never left again. Esquire to a knight. As a Crusader he was captured, later ransomed, and then returned to Italy. Franciscan tertiary. Lived the rest of his life as a hermit noted for his piety. Son of Saint John the Iberian. Held hostage for a while in Constantinople by the emperor. Helped his father build the Iviron Monastery on Mount Athos for Iberian monks. Abbot of the monastery c.1002 after his father's death. After serving 14 years, he resigned to concentrate on translation work. Translated the Bible, sixty writings of the Church Fathers, Bible commentaries, lives of the saints, liturigal books and other material into Iberian. Roman maiden at Trajanopolis, Greece, and may have been the daughter of a Roman senator. Arrested for her faith during the persecutions of emperor Antoninus and the governor Sabinus, she managed to destroy a statue of Jupiter before being imprisoned, tortured and martyred. Born to the Italian nobility. On the death of her parents, she became a nun at Brunate, Italy. 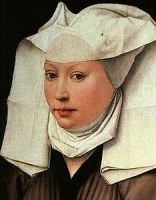 As abbess she affiliated her house with the Augustinian hermits. Built a hospice in Como, Italy, and encouraged frequent Communion for everyone. She was known as a miracle worker, and for her gifts of healing and prophecy. Daughter of Omar ben Hafsun, Christian leader of anti-Ummayad forces in southern Iberia during the Moorish occupation. Following her mother's death, she devoted herself to prayer and a desire for religious life. She fled the Muslim forces to a monastery in Cordoba where she was caught, kept prisoner, and finally executed. Martyr. Benedictine nun. First abbess of Rumsey convent in Hampshire after its restoration of King Edward the Peaceful in 967. Spiritual teacher of Saint Elfleda. 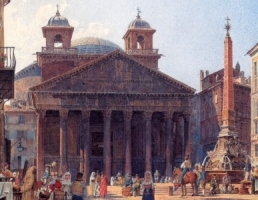 Commemorates and celebrates the dedication of the church of Saint Mary of the Martyrs, formerly a temple of all the pagan Roman gods called the Pantheon, in Rome, Italy by Pope Boniface IV in 609. Nun. Abbess of Holy Cross convent, a house of 200 sisters, Poitiers, France, assigned there by Saint Radegund. Introduced a rule given to her by Saint Caesarus of Arles. Friend of the poet Saint Venantius Fortunatus. Bishop of Milan, Italy c.740. Governed during the difficult period when the Arian Lombards were converting to orthodox Christianity. Vulfura had a dream in which he was told that in Cordoba, Spain he would meet a young woman with whom he would be martyred for his faith. Arriving in Cordoba, he met, was imprisoned with, and executed with Saint Argentea. Martyr. Hermit at Abingdon (formely Abbendun), Berkshire, England, which is named for him. Noted preacher. Founded a monastery in Berkshire. May be the earliest Irish saint. Bishop of Verona, Italy. Connected with the translation of the relics of Saint Firmus and Saint Rusticus. Priest. Imprisoned and tortured at Amphipolis and then Constantinople during the persecutions of Diocletian and Laudicius. Martyr. Travelled with Saint Cadfan to Wales in the 6th century. Spent the rest of his life as a hermit on the isle of Bardsey, noted for his holiness and wisdom. Third bishop of Auxerre, France. Fought Arianism. Priest. Martyred in the persecutions of Diocletian for overturning a pagan altar. 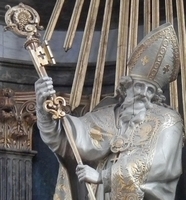 Fifth bishop of Soissons, France. A group of Catholic Christians martyred in the church of Theonas, Alexandria, Egypt by order of the Arian Emperor Valens. Their names have not come down to us.